As we embark on another era of commercial and residential development, never before has long-term planning been more important. The country is going through a phase of enormous change, from economic recovery to demographic and cultural shifts. Today's planning can shape the country for centuries, so we must get it right. Indeed, the planning system itself is also entering a phase of change and to discuss the issues arising, I met Deirdre Fallon, President of The Irish Planning Institute (IPI). Fallon is an executive planner with Meath County Council and is due to take up a similar position with South Dublin County Council in September. She has also worked in the private sector and brings a broad mix of experience to her two-year term as IPI President. The IPI is the all-Ireland professional body representing the majority of professional planners engaged in physical and environmental planning in Ireland. A priority in her role will be to emphasise the importance of good, integrated planning. "Planning has to be strategic at a national level and then feed down into local plans" she told me. An important development will be the new National Planning Framework (NPF), which is due to be adopted by government in the first quarter of 2017. The NPF will set out to co-ordinate planning with infrastructure on national, regional and local levels. "The planning system has to tie everything together, to make sure that everything happens in the right place and at the right time," Fallon said. The NPF is being prepared by the Department of Housing, Planning, Community and Local Government, and the IPI is contributing to the current consultation process. As well as highlighting the importance of "integrated planning" the IPI is stressing the need to plan infrastructural development, "so that growth centres can be delivered on time". The Institute is particularly anxious that the plan, when implemented, serves as a 'blueprint' across government, because "unless there's 'buy-in' from all government departments, it won't be implemented properly". The NPF will have a statutory footing so that new national, regional and local plans being developed will have to comply with it. Fallon told me that "the indications are that the NPF will be 'high level' and strategic, but it will be important to find the balance between generalities and clear direction". She is keen to counter any perception that the planning system slows development. She points to several changes to reduce costs such as the newly-standardised national guidelines on apartment development and the reduction in the Part Five (Social Housing) contributions, where the maximum contribution of 20pc of units has been halved. Development levies are also controversial and she pointed out that developers achieving planning permission now, or starting to build under an older permission, can avail of lower development levies. "While there is planning permission for 27,000 housing units in greater Dublin, the reason for the very slow rate of building, according to feedback from the IPI members, is a lack of infrastructure supporting those permissions, combined with the difficulty of raising finance," she told me. 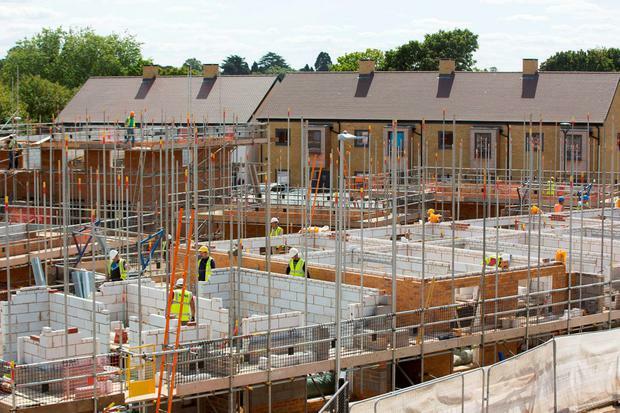 The IPI is supportive of Housing Minister Simon Coveney's Housing Action Plan, particularly its awareness of the need to fund infrastructure and "the positive emphasis on building communities, not just houses". However, the Institute is less enthusiastic about the proposal in the plan to direct applications for schemes over 100 units directly to An Bord Pleanála, bypassing local authorities. There is already a similar process for strategic infrastructural projects and Fallon said that "looking at the timelines, our members are saying that, in practice, this is not necessarily quicker". The Institute is also concerned at the spike in judicial reviews of planning decisions for infrastructural projects. Fallon said IPI members are wondering if properly resourced, multi-disciplinary teams in local authorities would not be able to handle these applications just as effectively. "Such teams can provide good pre-application consultation, leading to quicker and better decisions and fewer appeals," she said. Fallon is determined to increase public awareness of the planning process. "We want to get people involved and make planning more accessible" she said. As part of that process, the IPI recently made an award to Longford County Council, praising it for its adoption of "plain English" in its development plan. Planning is one of the most interesting aspects of property. We must get it right this time.